Chicago, IL – GPA announces their latest promotion: the “Growth Starts Here” booklet, which showcases the versatility and unique characteristics of their Ultra Digital® FlexBind® Layflat Pages. This corporate capabilities booklet serves as a compact and sleek introduction, and makes a big statement in a small package. The body pages were printed on 80# White Matte Cover with Flexbind® - Dual Hinge that features built-in hinges on both of the sheet’s long edges. This innovative construction allows for more book pages to be produced on each sheet, which is ideal for producing smaller books while maximizing time and resources. The end result is a professionalbook that lies completely flat with seamless photo spreads and an uninterrupted binding gutter. This sheet with dual hinge FlexBind® technology is perfect for small photo albums or pocket-sized brag books, school and sports memory books, high-end ownership manuals, modeling portfolios, corporate capabilities leave-behinds, and beyond. 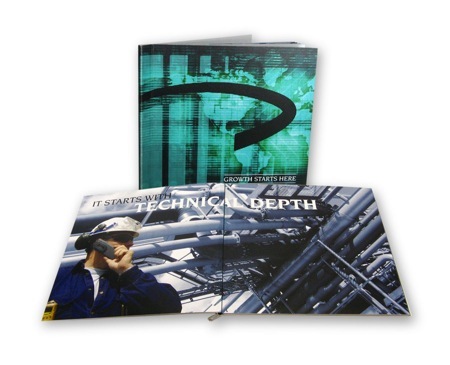 FlexBind® Layflat Pages are being used in almost every market today, including photography, architecture, consumer goods, sports, entertainment and publishing. Ultra Digital® FlexBind® Layflat Pages are RIT certified for guaranteed performance on HP Indigo presses. Finishing is easy since they are compatible with a variety of bookbinding methods, including side sewn, side stitched, Unibind®, FastBind®, ExactBind®, ChannelBind®, perfect binding and Powis Parker®. These premium papers are recyclable, elemental chlorine free, metal free and acidfree for long-term archival performance. GPA offers a wide range of FlexBind® Layflat Pages in different basis weights, textures, layouts, hinge options and with specialty papers to bring you more ways to create gorgeous custom books. See this product featured at Dscoop9 in March, at GPA’s booth #321. For more information or to receive a sample of this application, call GPA Customer Support at 800-395-9000 or visitwww.askgpa.com.